Timing is everything. It’s the less than a second win for the gold medalist; the near miss; the moment God connects your situation to an answer in His Word; and the prayer that’s answered. For the last 5 years, I’ve worked diligently through a process to obtain a goal. The process has been rich with knowledge gained, life-long friendships established, opportunity to grow and to be involved in new projects that have stretched my ability and comfort. Have you been there? Maybe you prepared your mind and home for the coming of a new child? Maybe it was a fitness goal? A job? A changed marriage? It really doesn’t matter the “what”. We all stretch and get out of our comfort zone. If you imagine a change or a goal and act upon that goal, there will be times of disappointment. Who are you in the disappointment? Not everyone gets the gold medal, and we live in a world of injustice and politics. Who are you when injustice occurs and sets you to sail on a different course that was unexpected? Yes, all the things I once thought were so important are gone from my life. Compared to the high privilege of knowing Christ Jesus as my Master, firsthand, everything I once thought I had going for me is insignificant. The very credentials these people are waving around as something special, I’m tearing up and throwing out with the trash—along with everything else I used to take credit for. And why? Because of Christ. If you were to take away all credentials and knowledge, would you be satisfied in knowing Jesus? Your resume is not your final destination. Don’t hold too tight or count on the letters behind your signature. Trust God. This verse came to me during a family member’s funeral. There is nothing quite like a funeral to remind you how life is short. What ARE we supposed to do with our time–until THAT day? God answers us. When the math doesn’t add up, life is “unfair”, and you are left standing in the middle of a difficult reality, you must steadily trust in God. His purpose for your life just may be in the disappointment or unanswered prayer. Faith is not in the outcome. Faith is your outlook. You must not define yourself by the disappointment, but trust in God that He is working in your life despite the sadness or disappointment. Within that trust, be hopeful in the promise that He is for you, not against you. You may feel the system has failed you, but God is bigger than man and systems, and He never fails you. What hope! What joy! What a promise! In order to experience this hope, you must be courageous and affirmed in the knowledge that your God story is yours–do not compare. Period. Your heart, soul, and focus are upward, not outward. It’s easy to love when things are going well. The greatest gift is to love when love is hard. Loving your spouse when they disappoint you, loving your child when they are angry, loving your enemy when they have slandered or offended you, love…………. What does that look like? It starts with God’s love for you and accepting this unconditional love. As you move forward, allowing your faith to change your outlook, get rid of toxic noise and claim the love of God. When you do this for yourself, and get rid of the “less than” thoughts, you begin to see others in the same light. You can love extravagantly outside of yourself and in a world that desperately needs love where bitterness, apathy, and injustice abound. Imagine extending love and understanding in areas of your life that offer dissension and criticism. I’m not talking about hugging everyone and offering a cookie. However, that could be kind. Love is not being a part of the gossip, but speaking truth openly. Love is offering solutions and a willingness to engage in positive change even when the other person is not. Love is forgiving the wrong and looking forward to a new day. Love is having the hard conversations and being honest. Love is not settling but working toward better, different, or change. Love is holding yourself and others accountable for actions. I love you most when I can be vulnerable with you in a safe place and heal. I highlighted in the verses above the word now. We can’t change our circumstances by regretting yesterday and worrying about tomorrow. We are only offered this moment to trust, hope, and love. Take a day in which you live in the now and notice God’s gifts–your spouse’s smile, a child’s giggle, a sunrise, and the sweet sound of the birds singing. Don’t be in constant pursuit of change and “what if”. God takes all your moments and writes your story. Trust Him with your now and enjoy. Brene’ Brown is an amazing social worker of research on shame, vulnerability, courage, and joy. Bottom line? If you want joy and courage it’s rooted in gratitude. We must first be a people of grateful hearts and stop complaining about what we don’t have or what happened to us. Okay it’s awful, it hurts, it seems like the pain will never end…..stop and look around you and be grateful. Practice gratitude. You can click on the title above to go to an article in Business Psychology. The article will describe the syndrome in detail. I was offered this story or syndrome in my time of disappointment. As humans, we like status quo and for everyone to conform to the norm. When you take a risk and stand tall, you will put yourself in a position to be judged. Your growth brings you to a point that others just might desire for you to “come down” from that lofty place, and “cut you down to size” (remember that expression?). 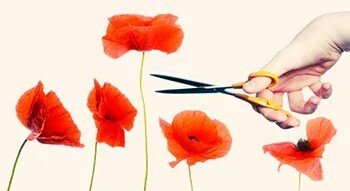 The tall poppy is “cut down” in order to maintain the average, or the comfort zone. Let’s put away the scissors and love–love each other on to growth and positive change. How can I help you succeed? How can each poppy feel safe to grow and take risks in a place of support and encouragement? What a thoughtful and “down to scripture” invitation to look at Gods work in our lives. Rather than being swallowed up in the pain and grief of a goal not attained, this writer points each of us back to our True North, Gods purpose for our lives, and reminds us of God’s reassuring presence through the journey of joys and disappointments in our lives. What a healing message is provided by this thoughtful disciple. You have been and will continue to be a strong, positive mentor in my life. I treasure you! THANK YOU for sharing the Poppy Syndrome story with me in our final presentation of Let Me Learn. I can never express in words the moment you shared the story with me and how healing was poured forth from your words and the presence of Him in you. Thank you faithful friend.